Rick, a retired US Coast Guard Rescue Swimmer contacted me about a month ago in regards to helping him honor fellow retired Coast Guard swimmers by designing an embroidered patch with some metaphoric iconography. All of the imagery going on was great and very meaningful to them, however after trying to simplify all of it and get all of the elements and typography to work together in a 4″x4″ patch… well it proved to be just too much. We agreed that this design would suit a t-shirt much better than a patch, especially since they all really liked the amount of detail. One thing I have to give credit to is the use of Joshua’s wings. I took this project on as a not-for-profit volunteer type of thing, so I needed to create the artwork efficiently, which is why I also retrofitted a skull that I already made as opposed to drawing a new one from scratch. Everything else completely original and all told, probably took about 5 or 6 hours in total, counting all the prep work, emails, coloring, etc. that goes into a project like this. I did about 5 different colorways on this and the above is my favorite. It has a Motley Crue goes underwater kind of feel to me. ~ by tracksix on May 26, 2008.
would you mind sharing what font you used on the Rescue swimmer retired text? I use a lot of their fonts as bases for my lettering, then embellish them a bit. Awesome work. I’m sure the client was really happy. By the way – I’m lying in wait for the launch of VECTOR TUTS!! I need to find retired rescue swimmers for a project I’m working on. do you have any info for Rick. Thanks. Do you know the status of this, either the patch or t-shirt? Retired RS wants to know. Don, I have patches of the original design, e-mail me at rmcelrath@gmail.com for details. Dave, an update on your artwork. 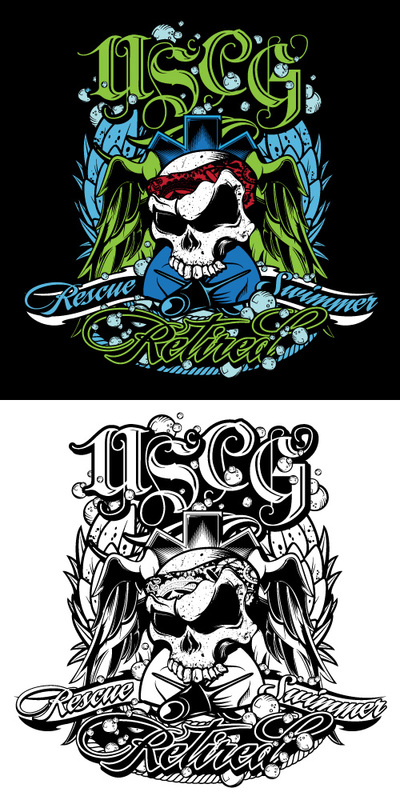 We didn’t get any shirts, the patches from that original design I sent you fit a patch better, but you’ll be glad to know that two of my rescue swimmer friends (one retired) have had your design tattooed on their arms! Whoa. Now that I’d like to see. I am a retired US Navy Rescue Swimmer, and I know hundreds of guys (and gals now) that would be interested in a Navy version of that logo. The Navy used to train all USCG swimmers. I had 4 “Coasties” in my RS class in 1985.